The new GARDENA AquaClean Li-40/60 Pressure Washer is particularly versatile when it comes to outdoor applications. It can be operated with a water tank or garden hose and can be used for watering the garden in addition to cleaning. The new GARDENA High-Pressure Washer AquaClean Li-40/60 is the easiest way to give your home and garden a thorough clean. This portable device does not require connection to a water or power supply and can be used for a wide range of tasks. Cleaning outdoor areas can be tedious — especially once winter is over and everything needs to be prepared for the new garden season. To help with this and many other tasks all year round, GARDENA is now releasing a new portable cleaning solution, the battery-powered High-Pressure Washer AquaClean Li-40/60. This device does not require connection to a water or power supply; the interchangeable lithium-ion battery provides all the energy required. With a working pressure of up to 60 bar, the AquaClean Li-40/60 easily removes even the most stubborn dirt without making much noise. The removable water tank has a capacity of 14 litres and can be filled easily via a tap before using the Pressure Washer. The pressure can be flexibly adjusted to suit any number of tasks, for example when cleaning more sensitive surfaces. A range of accessorie nozzles ensures convenient use for any task and can be stored in a net directly under the device water tank, saving valuable space. 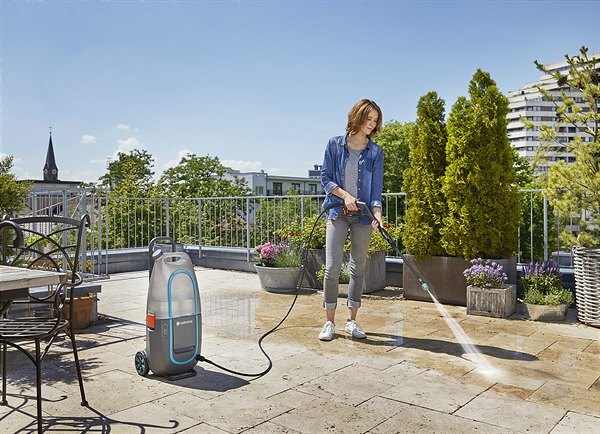 For longer tasks, the AquaClean Li-40/60 can also be used with a garden hose instead of a water tank thanks to the integrated GARDENA hose connection. This Pressure Washer is easy to transport with its large wheels and sturdy handle. You can also use the device for tasks other than cleaning: Since it can be operated with a GARDENA Watering Sprayer, this pressure washer can also be used to conveniently water plants in hard-to-reach areas of the garden. There are various attachments available for the GARDENA AquaClean Li-40/60 that can be used for more specialist cleaning tasks. The flat nozzle is particularly effective at removing coarse dirt on garden tools, furniture or bicycles. The rotating nozzle uses a rotating water jet to effectively clean surfaces. The surface cleaner is the perfect choice for cleaning terraces and pathways quickly and splash-free. With its interchangeable 40-V battery, the new GARDENA AquaClean Li-40/60 is also a new addition to the extensive GARDENA HeartBeat system — a powerful battery system that provides users with the right device for every task in the garden.